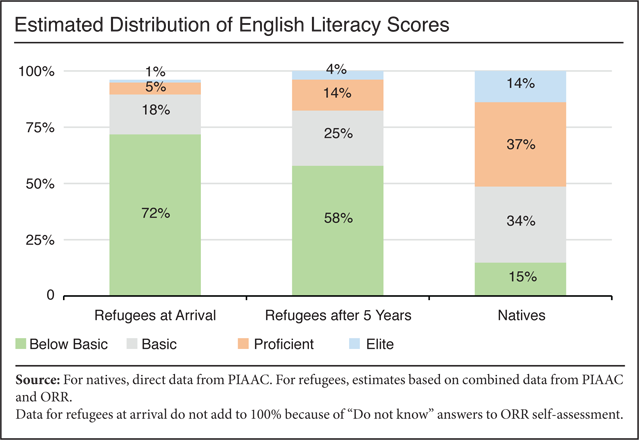 In light of the renewed debate over the fiscal impact of refugees, and given the importance of English skills to getting ahead in the United States, it may be useful to explore the intersection of literacy and refugee status in more detail. Focusing on the refugees who arrived in 2011, we see that self-assessed ability is low, but some improvement is evident during the first five years. The percentage speaking English well or very well, for example, rises from 12.6 percent to 42.1 percent after five years. Self-assessments are, of course, subjective. For objective data on English ability, we can look to the literacy portion of the Program for International Assessment of Adult Competencies (PIAAC), a battery of tests administered in the United States between 2012 and 2014. The literacy test measures not just simple English vocabulary, but "understanding, evaluating, using, and engaging with written text to participate in society, to achieve one's goals, and to develop one's knowledge and potential." Approximately 72 percent of refugees upon arrival are "below basic", which is sometimes described as functionally illiterate, and that percentage declines to 58 percent five years later. In other words, improvement occurs soon after arrival, but a large gap with natives remains. This result should not be too surprising, and one could hardly "blame" refugees for struggling with a foreign language that they have had little time to master. Nevertheless, the literacy data affirm that resettlement in the United States involves a difficult transition. The combination of low English literacy and low levels of education — about half of all recent refugees age 16 and over did not arrive with a high school diploma — suggest that it will be a long time before today's refugees become net fiscal contributors, if at all. For more on the economic thinking behind the president's approach to refugees, please read Steven Camarota's Backgrounder, "The High Cost of Resettling Middle Eastern Refugees".